"What started as a week in the 1920’s and grew to a month in the 1970’s will inspire a movement today. In 2015, inspired by the will and tenacity of our people to refuse the chains of our history and the limitations of our present we declare this February and all Februaries #BlackFutureMonth. We honor the fact that our history and our future is not a single narrative, but a mosaic of experiences. Standing in the present and inspired by the past, we will envision the future we are fighting for—a future where black lives matter, black love reigns, and black people are free." Black love is stigmatized in public AND private spaces. Black love is inherently queer. It is the future. It is a transgession of the cistem. Black love will not die. Black love is Black Future Month. Black Future Month is a profession of blaq love. It is a promise of the past and the future. "Black Lives Matter is a unique contribution that goes beyond extrajudicial killings of Black people by police and vigilantes. It goes beyond the narrow nationalism that can be prevalent within some Black communities, which merely call on Black people to love Black, live Black and buy Black, keeping straight cis Black men in the front of the movement while our sisters, queer and trans and disabled folk take up roles in the background or not at all. Black Lives Matter affirms the lives of Black queer and trans folks, disabled folks, Black-undocumented folks, folks with records, women and all Black lives along the gender spectrum. It centers those that have been marginalized within Black liberation movements. It is a tactic to (re)build the Black liberation movement....When you design an event / campaign / et cetera based on the work of queer Black women, don’t invite them to participate in shaping it, but ask them to provide materials and ideas for next steps for said event, that is racism in practice. It’s also hetero-patriarchal. Straight men, unintentionally or intentionally, have taken the work of queer Black women and erased our contributions. Perhaps if we were the charismatic Black men many are rallying around these days, it would have been a different story, but being Black queer women in this society (and apparently within these movements) tends to equal invisibility and non-relevancy." Erasure is an epidemic on white supremacy, heteropatriachy, cisgender classist abilist institutions and frameworks. This is a sad but expected article to read. It is not surprising to find black queer women behind the creation of the #blacklivesmatter campaign. Frequently movements surrounding community organizing are led by qtpoc and feminine of center individuals. The movie "Sleep Dealer," directed by Alex Rivera, raised a number of questions about immigration, drone warfare, the surveillance state, and how human rights will be contested in a future where labor is subjected to 12-hour days in factories hundreds of miles away from their work. I found the movie fascinating and scary in its depiction of how humans related to machines. Despite what Rivera said about how the world he depicted could make us more connected, I did not find the work Luz did very encouraging. Perhaps it is my technophobic instincts, but I felt like the connection Luz created through her memory machine felt much less real than interpersonal interaction. More importantly, in the Q and A I wanted to ask what Rivera thought about the use of drones primarily in Syria, Pakistan, and Afghanistan to kill suspected "militants," when much of the time these militants are civilians. How did the state and the corproate sector relate to the use of drones in the film? Did the state own the drone which killed Memo's father, or was this a corporate creation? It seemed to be the product of the state and corporate culture in collaboration. I wonder what Rivera thinks about drone technology now that it has proliferated and countless nations are using drones for police surveillance of predominately black and brown bodies. These are some of the more global connections and questions I felt like his film helped foster. When there is an attack on the pillars upon which a State was founded, everyone is deeply affected. From lost lives to threatened values, French society has rallied in an outcry protect their rights and the French Republic. Presidents, Prime Ministers, Mayors and countless other political officials from around the world have expressed their solidarity for the 17 people killed in the Charlie Hebdo attack committed by two young men on January 7th 2015. Massive public demonstrations and social media support inundated the media with slogans and hashtags, namely #JeSuisCharlie. However, as Stanford University Professor David Palumbo-Liu notes in his piece on the movement, there is a fine line between “supporting the victims of violence” and “unequivocally supporting their message.” Indeed, claiming “Je Suis Charlie” comes with heavy baggage. France and its Diaspora have baggage containing decades worth of post-colonial challenges including racialized anti-immigrant tension, xenophobic violence, and systematic imperialist policies. Before being able to fully grasp the horrors of the Charlie Hebdo attack, we must take the time to trace the roots of this act of terror in order better understand the complexity of the human right to free speech. In France, it is well known that African immigrants, especially from North-Africa and other Muslim majority countries, along with their second-generation French-born children face systematic social and economic exclusion. These populations face widespread discrimination when seeking employment because of their Muslim or African names and are segregated to the outskirts of cities - the banlieues - because they lack the financial means to live elsewhere. For over 30 years the French government has promised and somewhat attempted to address these issues, yet they continue to persist. As the New York Times reported, “youth unemployment in these neighborhoods reaches 40 percent, and feelings run high that mainstream society discriminates against those who do not [...] 'have the right family name or the right skin color'." While France deems the right to free speech as central to ensuring liberty, equality and fraternity, we have to ask ourselves, who are these freedoms extended to? The two men who committed the atrocities were amongst the disenfranchised immigrant youth suffering from unemployment, marginalization, and racialized over-policing. This does not absolve them from their fault in any way, but it raises important questions about how to prevent the spread of extremist sentiments. If France's fundamental freedoms are not truly extended to all its citizens, then the French Republic and population needs to seriously reevaluate its practices and notions of what “French Integration” and Human Rights mean. France - and by extension, Europe - needs to address the xenophobic and structural social exclusion of immigrants, which has become a pervasive problem for major metropolitan cities including (but certainly not limited to) Paris, London, Berlin and Madrid. As a French-American woman of color, I have observed the harsh similarities between racialized attitudes and policies towards Muslims and North-Africans in France and the systematic racialization of people of color in the United States. A major similarity is how the media and public internalize and externalize race issues, and fail to distinguish faith and national origin from terrorism. By omitting terms such as “jihadists” and “North-African” from the opening statement, this article attempts to counteract the predisposed implicit bias that exists in both Europe and the United States and pervades the media, infects our racial conceptions and feeds into negative stereotypes about Islam as a whole. Though stark similarities in the discrimination of minority populations exist in both countries, the construction of racial ideologies differs. France does not use the all-encompassing term race as we do in the United States, but rather uses specific ethnic terminology, national background and skin-color to describe and categorize race. Highlighting the differences of racial formation and linguistic terminologies can helps us actively engage in understanding the pervasiveness of racialization, which in return offers critical insight into addressing a systemic transnational social issue: minority inclusion. 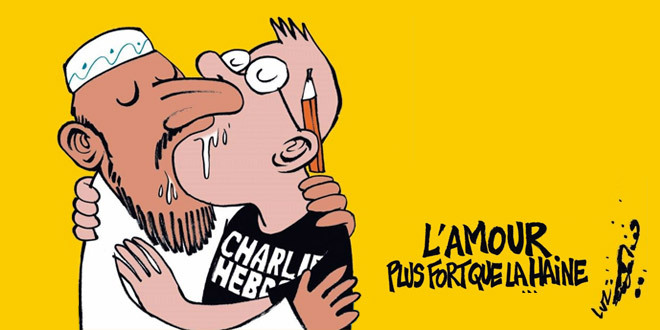 As we reflect on terrorism, media portrayal and the racialization of non-white and non-european minority groups, we should ask ourselves is the Charlie Hebdo caricature, “L’Amour plus fort que la Haine” a possibility? Is love indeed stronger than hate towards religious and racialized ethnic minorities? Can we realistically achieve Liberty, Equality and Fraternity for ALL?